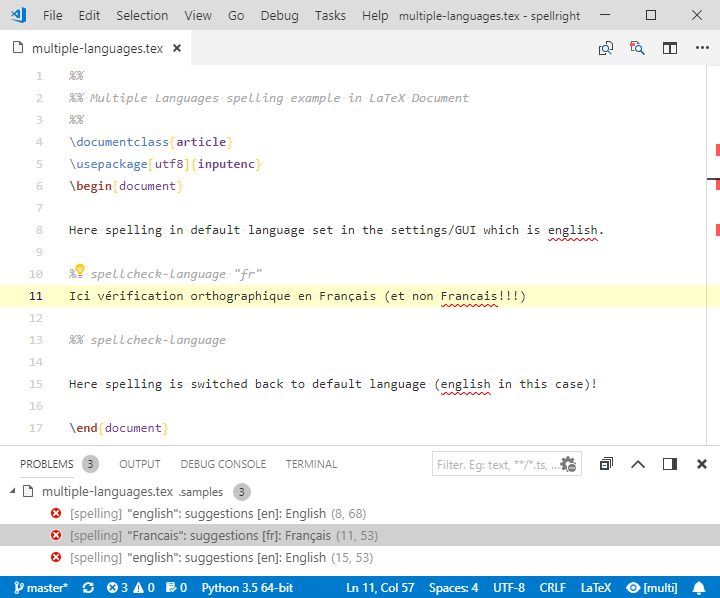 Visual Studio Code>Other>Spell RightNew to Visual Studio Code? Get it now. Supports use of multiple workspace plaintext file dictionaries which may be used for specialized vocabularies like medical terms, trademark names etc. Spelling documents' syntactic elements e.g. comments/strings in different languages (e.g. strings spelled in English and comments spelled in French). Spelling of multiple languages in one document either by selecting more than one language for spelling or using In-Document commands to switch between languages. Case sensitive which means that it will distinguish between english and English, french and French and which is critical in some western languages like e.g. German. Spells CamelCase, snake_case and digit2inside compound phrases respecting Unicode capital/small letters distinction (e.g. : SuperŚlimak is spelled as Super Ślimak) and capital letter adhesion (e.g. : HTMLTest is spelled as HTML Test). Unobtrusive GUI/command interface for switching spelling dictionary (language) and turning spelling ON/OFF for particular document class. In-Document commands allow to switch spelling ON or OFF despite global settings and change spelling language multiple times within the document. Small memory & CPU usage footprint - uses offline, OS native spell checking backends: Windows Spell Checking API (windows 8/10), NSSpellChecker (macOS) and Hunspell (Linux, Windows 7). Extension uses background processing (on idle) and differential edit notifications to minimize area spelled during editing only to lines touched by changes. Spell Right requires spelling back-end which is different for various platforms. Please read carefully the section below on how to provide dictionaries for Spell Right to work properly. If you have any problem with installation or you see that Spell Right does not work with some type of document please read carefully the lengthy README file below and if nothing seems to be related to the problems you face post an issue here. On Microsoft Windows from version 8 on Spell Right uses system spelling API. Follow system guidelines, like here or here, on how to install additional system spelling dictionaries. On macOS Spell Right uses system spelling API. Dictionaries subfolder does not exists there by default and has to be created manually. In case you run Insiders edition of VSCode then Code part of the path has to be changed to Code - Insiders appropriately. Spell Right cannot automatically match the dictionary name with system locale settings when using Hunspell dictionaries hence at first run dictionary has to be selected manually (e.g from status bar). Dictionaries from the folder will be listed in the language selection list and used for spelling documents. Because Hunspell engine is slower in serving suggestions to misspelled words it may be useful to set spellright.suggestionsInHints to false which will speed spelling up and suggestions will still be available in context menu called upon action for the suggestion. Spell Right stores words considered as spelled correctly and not existing in the main spelling engine (a.k.a. ignored words) in plaintext dictionary files. 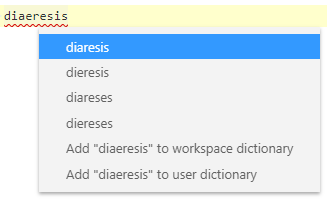 All the extension's commands add words to two main files, user and workspace dictionaries, both contained in spellright.dict files, one located in user settings folder and the other in workspace settings folder (.vscode). Besides these there can be any number of *.dict files in workspace settings folder e.g. dictionaries containing specialized vocabularies like medical terms, trademark names etc. User dictionary is always used and workspace dictionaries are used in the context of opened folder. All provided dictionaries are used in conjunction. When spelling source code class of document which provides symbol information for the document (e.g. the symbols which are used when Ctrl+Shift+O is pressed to perform GoTo symbol operation) the symbols are used for spelling of the document. It reduces the number of false spelling warnings mostly in comments which provide source code documentation on the usage of these symbols, e.g. variables, function parameters etc. Use F8 or Shift+F8 to jump to next/previous spelling error. Alternatively same result can be achieved selecting command SpellRight: Select Dictionary (Language) or SpellRight: Turn OFF for Current Document Type from the command palette (F1/Ctrl+Shift+P). Language selector allows to select more than one language. Document is then spelled using all of the dictionaries and when a token (word) is considered correct in one of the dictionaries it is considered as spelled correctly. When it is not, then suggestions for all selected languages are shown. Pops dictionary selection list. Selecting language also turns spelling ON. The list also allows to turn spelling OFF for currently open document type. Can also be reached by clicking indicator field in status bar. Turn spelling OFF for currently open document type. Open in editor spellright.dict file from user settings folder. 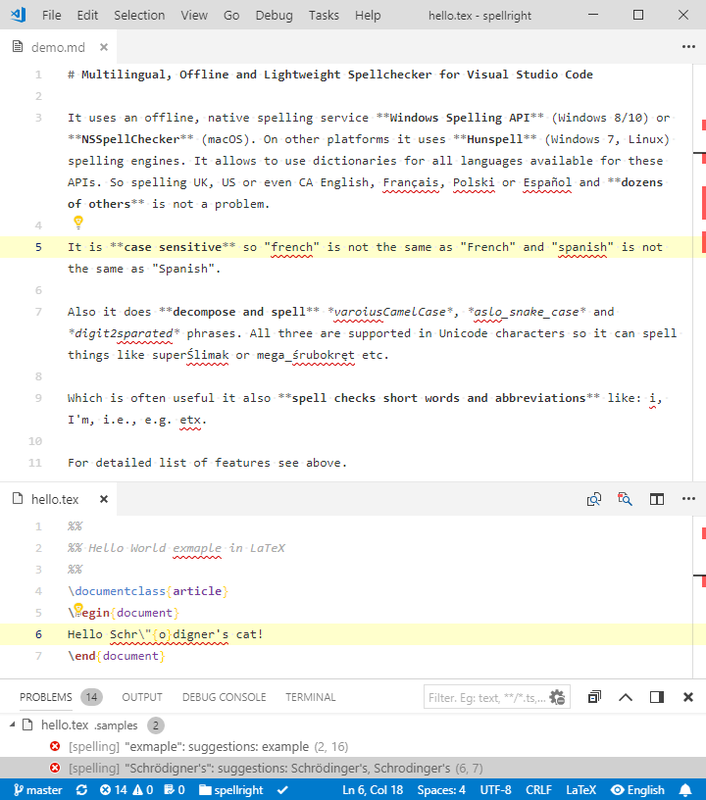 Open in editor spellright.dict file from workspace settings folder (.vscode) appropriate for currently open document in (multi root) workspace. Add text selected in editor to main workspace dictionary appropriate for currently open document in (multi root) workspace. Add text selected in editor to main user dictionary. Saves current state of GUI (that is language and map of documents classes spell checked) to appropriate configuration file. Works only if "spellright.configurationUpdate" is set to false. Default language (dictionary/country name) used for spelling. Typically in a LANGUAGE (e.g. : "en", "fr", when "spellright.groupDictionaries" is true) or LANGUAGE-COUNTRY format (e.g. : "en-US", "en-GB", "fr-CA", "pl-PL", when "spellright.groupDictionaries" is false). When Hunspell spelling engine is used (e.g. in Windows 7) this setting should be the name of the dictionary file without extension. In case language parameter is not set then language from OS locales is used. Enable/disable language & status indicator switch in status bar. Enable/disable including suggested corrections in hints. Disabling suggestions significantly speeds checking up. May be useful in case of large, often switched or saved documents. When true words added to user dictionary are stored in system default custom spelling dictionary instead. Enable/disable grouping of dictionaries by language. Disabling grouping results in displaying dictionaries for all regional variants (e.g. en-US, en-GB, en-CA etc.) as separate entries. When enabled regional dictionaries are displayed as single dictionary under common language name (e.g. "English"). Works only on native Windows & macOS spelling APIs. Enable/disable re-checking of entire document after file is saved. Document types for which spelling will be turned ON by default. avoid spelling of "minted" code blocks in LaTeX documents. Please mind the fact that both "spellright.ignoreRegExps" and "spellright.ignoreRegExpsByClass" may have serious impact on performance. They are applied on whole document before every, even smallest spell check, has to reapply these filters so they may cost time in complicated expressions. Set of file patterns to globally, silently exclude files from being spelled. Files described with this setting will not be reported as forced OFF spelling (red indicator in status bar). Patterns defined as for gitignore. Allows to change class of diagnostic messages produced by Spell Right which changes in turn underline color. Possible values (with corresponding underline color) are: "error" (red), "warning" (green), "information" (green), "hint" (invisible). will produce "information" class diagnostics for documents spelled with code parser. Possible values on left side of the association are: plain, markdown, code, latex and xml. strings - strings in programming languages. 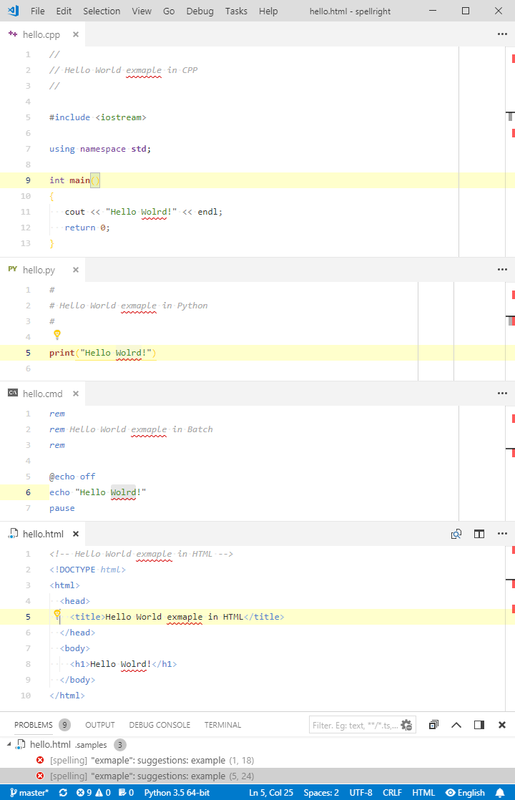 disable spelling of comments in Python documents. will spell strings in American English and comments in British English of course if the "spellright.groupDictionaries" flag is set to false. Configuration item "spellright.languageContext" is more important than "spellright.language" but less important than In-Document commands. will spell body of latex documents in French and comments in English. Configuration item "spellright.languageContextByClass" is more important than "spellright.language" and "spellright.languageContext" but less important than In-Document commands. If set to true then each operation on the GUI (change of language, turning spelling OFF for particular document type) is automatically saved in appropriate configuration settings (workspace if workspace is open and user if not). Setting to false requires using of "spellright.configurationUpdate" command to save the changes performed in GUI. Allows to decide which configuration gets updated when "spellright.configurationUpdate" is set to true. Possible values are user and workspace. xml - spells comments and everything outside markup. If set to true Spell Right will use document symbols (variable, function names etc.) when spelling source code documents. Significantly reduces number of misspelled words in doc-strings and in comments whenever a symbol used in code is used and the symbol does not disassemble to properly spelled parts using CamelCase, snake_case etc. separation. Forces switching spelling language for the following part of the document or until next spellcheck-language "CODE" command. CODE is language code according to used spellcheck background service, typically in a LANGUAGE or LANGUAGE-COUNTRY format (e.g. : "en", "fr", "en-US", "en-GB", "fr-CA", "pl-PL" etc.) If CODE is empty switches back to default spelling language. In-Document commands for switching spelling language have highest priority over "spellright.languageContextByClass" and "spellright.languageContext" and "spellright.language" configuration items. Forces spelling OFF for the entire document despite global settings. Forces spelling ON for the entire document despite global settings. Has higher priority than turning spelling off with both In-Document spellcheck&#x2d;off command and .spellignore patterns. .spellignore file located in workspace root directory, appropriate to currently open file in (multi root) workspace, can be used to disable spelling for files described by gitignore syntax file patterns. Select appropriate class to be able to spell the document. If spellright.configurationUpdate is set to true assignment will be written to the configuration settings either user or workspace according to the value of spellright.configurationScope setting. Hint box associated with "Bulb" Code Action has an ugly habit of wrapping text at certain width not at white/punctuation character thus suggestions got cut in weird places (this is probably more of a VSCode's issue). There is a limit, imposed by VSCode, on the number of diagnostics that an extension (Spell Right among) can provide for one file. The number is 1000 and Spell Right cannot display more spelling errors. Once the spelling errors from the head of the file are corrected or added to the dictionaries more issues will appear at the end. Due to bug in NSSpellChecker layer of macOS Spell Right cannot currently use dictionaries installed in ~/Library/Spelling folder, just those that came with the system. There are rare situations when dictionaries are not reported correctly on Windows using Windows Spelling API (Windows 8+). They can result in no dictionary or only some dictionaries available. So far the reason for this is unknown but seems to be outside of the extension (see #106 and #53 for details). This extension can be considered a Work In Progress. Please report all the errors and/or annoyances that you see on the issues page.